It’s that time of year when even the most selfish of selfish knitters think about wrapping others in woolly goodness. It was what inspired me to pick up the sticks in the first place – I randomly decided to knit my Dad a scarf for Christmas back in 2006 and I’ve been hooked ever since. I love knitting gifts for my friends and family, tailoring the colours and styles to each person and giving it that personal touch. My gift knitting list is a little out of control, I’m unlikely to get through it even though I started in October. My Dad has thrown a spanner in the works by requesting a balaclava! (Anyone have a good balaclava pattern?) Nevertheless, come Christmas day, I’ll have knitted my way through most of it. If you haven’t started yet it’s not too late – all the patterns below can be knitted in a few days. 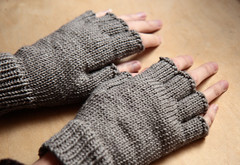 Knucks by Pamela Grossman (free) is a really useful pattern for fingerless gloves in men’s, women’s and children’s sizes. They can be knitted with any DK weight wool or wool blend. You’ll need 3.5mm DPNs or circular needle. The men’s ones in particular have gone down well with recipients. I’ve knitted the women’s size with under 50g of Mirasol Hacho, making them very economical and a great use of a single skein of hand-dyed DK. Naganasu’s Lacy Mitts (PDF, free) are perfect if you want something more unusual. They’re knitted in 4ply (though lace weight would work great as well) on a 3mm circular needle. They can be made to any length. Eunny Jeng’s Endpaper Mitts (free) have the wow factor but they’re not one to choose if you’re in a hurry. Not only will the fairisle slow you down but the Italian tubular cast-on may take you a few goes to master if you’re not familiar with the technique. I normally shorten the pattern to speed it up. They are knitted on DPNs (size depending on finished size) using 4 ply yarn. Thorpe by Kirsten Kapur (PDF, free) is a simple, versatile, unisex hat in chunky yarn that can be knitted in a couple of evenings. The optional fairisle, earflaps and edging can be knitted in different colours – great for using up odds and ends. You’ll need a 5.5 mm circular needle of DPNs. I get asked to knit more slouchy hats than anything else. Sarah Moore’s High Street Hat (free) is just the ticket, and would be especially well received by hard-to-please teens. You’ll need some chunky yarn and 5.5 and 6 mm circular needles. Ysolda Teague’s Ishbel (£4.50) definitely deserves a place in this list, even though I’ve mentioned it before. 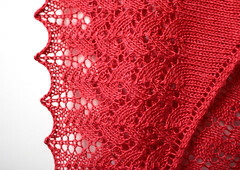 I’ve made many as gifts and they’ve gone down well – lace work always looks stunning. Don’t be afraid to experiment with different yarns – I’ve used DK weight silk which gives it a real element of luxury. It’s such a versatile pattern, there are two sizes and it can be worn in different ways to suit all tastes. It knits up quickly on a 4 mm circular needle, the small version typically takes me four evenings. What a great round-up of sort-of quick and satisfying holiday knits! I will definitely be referring back when I’m down to the wire…like right now!